We would not face rule changes by the owner such as changing the park to a family park. We would decide the park rules. We would elect officers of a new Home Owners Association. We could bring issues before the Home Owners Association for action. Repairs or maintenance needed to the park. Any other items we think are of importance to the park residents. We would not face the possibility of a condo conversion by the owner. We would not face future rent increases from the owner. We do not need to make a profit like the owner does. The monthly fee we would pay only needs to cover our expenses. The monthly fee would probably decline over time as we pay down our purchase expenses and build a reserve. It is highly unlikely that we would have to increase the monthly fee that is set at the time of purchase. This has been the experience of other resident owned parks. Each space that participates (by buying a share) will be a member of the new Home Owners Association. The Home Owners Association would buy the park. Each space that is a share owner of the Home Owners Association would be a part owner of the park. We can only speculate at this time because we do not know what the purchase price or other expenses would be. It would also depend on what financing program we use (private, government assistance or a combination of both). See attached example based on the price asked when Vera Carson was for sale in 2007 and the owners expenses listed on the for sale flyer at that time. Each space that participates will buy 1 share of the new Home Owners Association. The money paid for the shares will provide the funds needed at the time of purchase. Down payment, closing costs, Home Owners Association reserve and any other expenses that are needed at the time of purchase. The monthly space rent will be replaced by a monthly Home Owners Association fee. This fee will cover ongoing expenses required to run the park. Mortgage payment, property tax, insurance, gardener, common area utilities and other such expenses. There are a number of organizations both public and private that can assist us in obtaining the funds needed to buy the park. Low cost state government loans. These loans usually require more paperwork to qualify and take longer to complete. Some loans to low income borrowers may also limit who you can sell to and how much you can charge (buyer must qualify as low income and sale price must qualify as low income). Commercial bank loans. These loans usually charge a higher interest rate but require less time to get and do not contain future sale requirements. Possible assistance from the City of Carson. The city did provide some financial assistance in the form of a low cost loan to the residents of Nu-Way Mobilehome Park when they purchased their park. Any assistance from the city would depend on money being available for them to use and the case we could make to them for assistance. The members of the Home Owners Association would decide if they would manage the day to day operations or hire a management company to do the management. Any resident that does not participate by buying a share of the Home Owners Association would remain as renters. They would pay their rent to the Home Owners Association. They would be subject to rent increases (just as residents are today). They would not have any say in the rules of the park or how the park is managed. When a resident that does not participate wants to sell their mobilehome the new buyer will be required to buy a share of the Homeowners Association as a condition of sale. Over time this will result in all spaces being owners of the park. Any resident that does not participate in the beginning will be able to join the Homeowners association at a future date buy buying a share of the Homeowners Association. When a participating resident sells their mobilehome they will be given back the amount that they originally paid for their share of the Home Owners Association. When a mobilehome is sold all new buyers will be required to buy a share of the Homeowners Association whether the seller is a member or not. Over time this will lead to all residents participating in the ownership of the park. Editors Note: This article was written by Tom King, resident of Vera Carson MHP, in Carson. 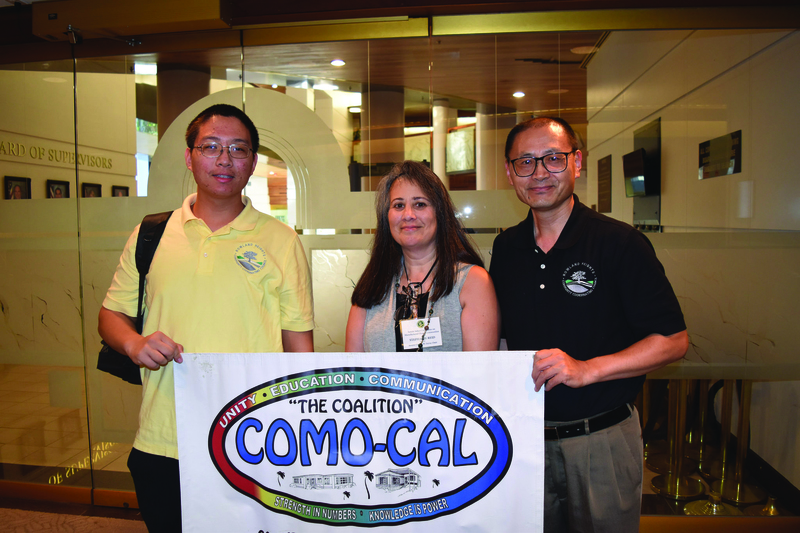 CoMO-CAL supports residents groups who are interested in purchasing their park. In fact we have published several articles on the subject, many were written by David Loop. There are many organizations that help residents purchase their parks. Deane Sargent (PMC Financial, 650-375-8043) has made a DVD on purchasing your park and will send you a copy FREE upon request. You can email Deane at dsarg7344@aol.com. We have an informational flier: What you need to know before you purchase your park. Call or email us for a copy. We are here to help!